The ‘atLEAF CHL’ meter is economical & simple to use. This meter is considerably less expensive than other similer meters and, most importantly, is very simple to operate. Measurement results can also be downloaded to a Windows™ OS computer via a USB connection (atLEAF CHL PLUS). See below for details on each model. Measurement results are available in less than one second - providing a short turnaround for multiple tests. Using the ‘atLEAF CHL’ meter to quickley measure plant chlorophyll levels. Both the atLEAF CHL STD and atLEAF CHL PLUS are a powerful, handheld, easy to use device for non-invasively measuring the relative chlorophyll content of green leaf plants. Plant relative chlorophyll concentration is measured by inserting a leaf into the device aperture. Green leaves of up to 0.1 inch (3mm) thickness can be measured. It only takes one press of the key to perform a basic measurement. Chlorophyll content can be an indicator of the plant’s condition. In general the measurement value of a plant leaf enjoying good health should be 35 or above (depending on the type of plant). Measurement should be considered relative to the healthy range for a given species when monitoring over time. In short: Higher chlorophyll readings indicate healthier plants. Note: It is recommended that users read further information (available online) on the principles and utilisation of chlorophyll meters for plant & crop health. 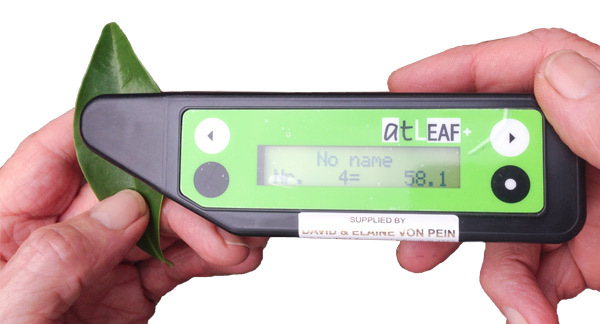 Contact The Meter Man, David von Pein to discuss how you can make use of this Plant Chlorophyll Meter!